Add to Spectra-Tex Airbrush Colors to increase transparency or to create lighter color values . Can be used to thin paint. Will not affect permanence. Biodegradable, concentrated to clean airbrushes and color cups between color changes. 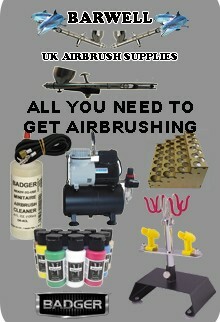 Run Airbrush Cleaner through airbrush then rinse airbrush with water before spraying new color. Ready to spray protective top coat which dries to a clear matte finish on most porous surfaces. Ready to spray protective top coat which dries to a clear gloss finish on most porous surfaces.